FRAGRANCE PREP: Combine the Litsea and Spearmint essential oils in a glass container and set aside until step 3. MOLD PREP: Using cardboard, cut three dividers that fit snugly down the center (lengthwise) of the mold. Cardboard brackets on either end can help with stability. If you don’t want to use cardboard, Bramble Berry has a retrofit divider set here for the classic sliding bottom 5 pound mold. TWO: Combine the Cocoa Butter, Coconut Oil, Olive Oil, Rice Bran Oil and Palm oils (remember to fully melt then mix your entire container of Palm Oil before portioning). Once the lye water and the oils have cooled to 130 degrees or below (and are ideally within 10 degrees of each other), add the lye water to the oils and stick blend until thin trace. If you’d like a harder bar of soap that releases faster from the mold, you can add Sodium Lactate to the cooled lye water. Use 1 teaspoon of Sodium Lactate per pound of oils in the recipe. THREE: When the batter reaches light trace, add the essential oil blend. 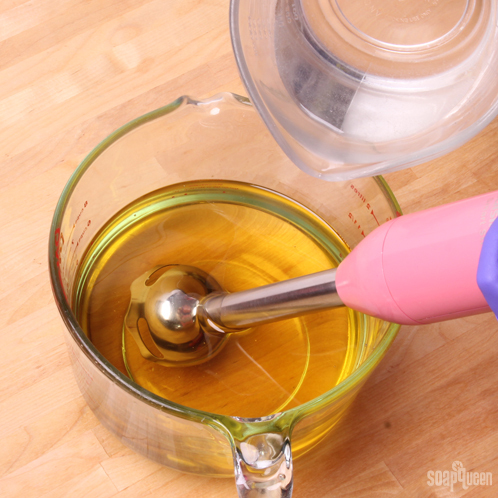 The Litsea Essential Oil will breakdown the trace, so be sure the batter is fully emulsified before moving on. You may need to stick blend for 10 – 20 seconds. FOUR: Split the batter evenly into four contains. No need to be exact, but each container should hold about 11 – 12 ounces. Stir in the colorants with a wire whisk or spoon. Quick note: We used cardboard dividers here, but for ease of use the new Multi-Pour Sectioning Tool can’t be beat! This sectioning tool set is perfectly fitted for our 5 Pound Wood Mold with Sliding Bottom. It divides your 5 pound soap loaf into either 3 or 4 sections. Keep in mind it only fits the 5 lb. Wood Mold, so it’s too big for this tutorial. 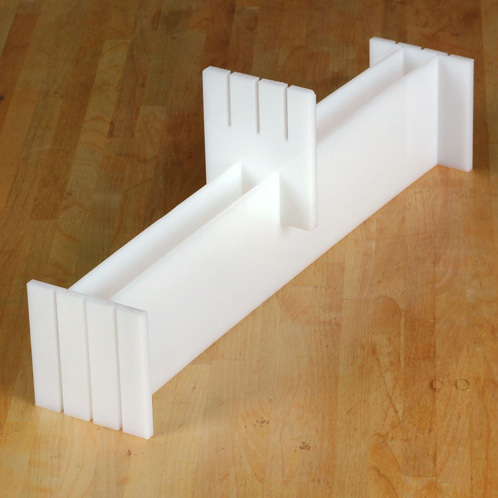 If you want to try the dividers in the bigger mold, simply resize the recipe with the Lye Calculator and set the dividers into the mold. SEVEN: For now we’ll stick with the cardboard, and for this part you may need to grab a friend. Make sure your center pieces of cardboard are stable and then get someone to help you simultaneously pour the colored batters. Tamp the mold on the table several times once all the soap has been poured, and then slowly lift the cardboard straight up and out of the mold. EIGHT: Insert a chopstick or dowel down to the bottom of the mold. 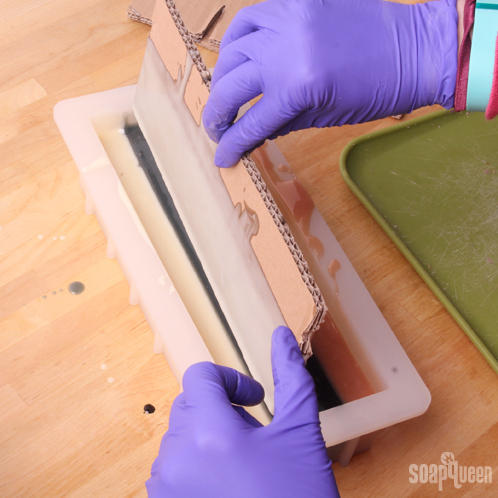 Then, move it back and forth horizontally through the soap, working your way up the mold. NINE: Repeat this process, except this time move the dowel up and down vertically. 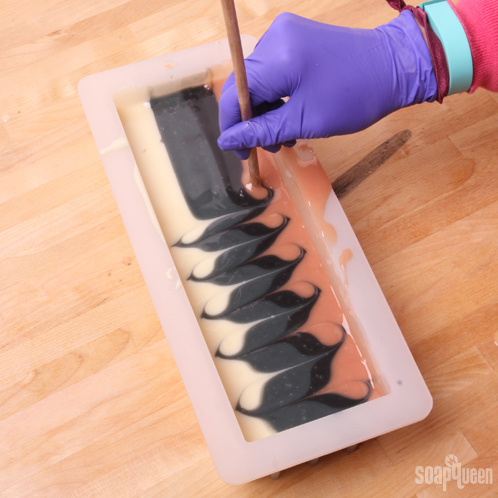 Allow the soap to sit in the mold for 24-48 hours. When it’s time to cut, you can cut the loaf in the traditional way, but I find that the swirls really shine when I cut the bars horizontally. If you’re not sure how to cut bars horizontally, there’s a video for that here. Cure for 4-6 weeks and enjoy! “Thank you for taking the time to contact us regarding our Spectrum® Organic Shortening. We apologize for the delay in our reply and appreciate your patience. Today I’ve made the Taiwan Swirl. My hand was shaking a little bit when I started the swirl but in spite of that, it turned out pretty well !! The thing is, I was planning on making another batch of soap later today, but I read in some book that you should never pour raw soap down the drain. I usually put away my soaping utensils in a plastic bag and wait 24 hours before washing them. But today I wish I could have them clean and ready in a few hours. Could you please let me know if this can be done and what precautions should be taken? So glad your swirl turned out well! Also, we typically wash our dishes with raw soap right away and don’t have any problems. You may want to check with your plumber just to be sure! I’d like to know if I can substitute palm oil with palm shortening (Spectrum >> Certified Sustainable made with palm oil) in this recipe. If this is possible, where should I enter the amount of palm shortening in the lye calculator? in the palm oil or vegetable shortening box? From a quick internet search, it looks like palm shortening is palm oil with some of the unsaturated fats removed. That makes it firmer, and have a higher melting point. I love all your wonderful soaps!! I make smaller batches — usually 2-2.5 lbs. Is there a rule of thumb to use in downsizing the amount of colorant? I’m pretty sure it’s not linear so is it best just to eyeball and see how you like the color? Also, i’ve noticed that when i’m using the 1 lb loaf, it seems that after a week, the soaps are still a bit soft — bottom dents when i push on it. Should more sodium lactate be used? Am using the swirl pre-mix at 5% superfat (calculator on swirl web page). Thanks so much, glad you like the soaps! Also, you are correct – how much colorant you add depends on the colorant itself, and your personal preference! Thank you for your website, I love all the crafts you are doing. 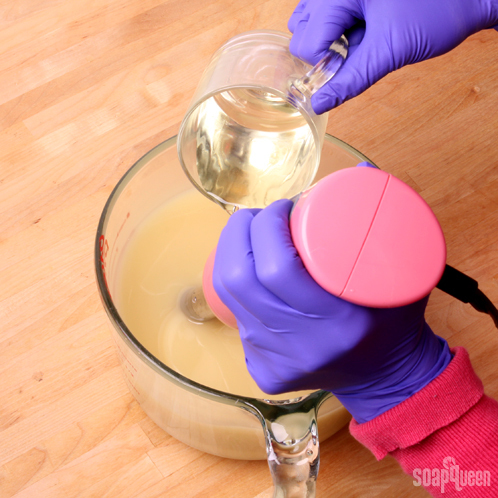 I want to do your moisturizing soap recipes from an old post, your favorite’s. I am not sure when you refer to “palm oil”, whenever you refer to that, is it the same as the “red palm oil”? I have been searching local stores for the “palm oil” but they all say red palm oil. Is it okay to use that for recipes whenever you have “palm oil”? Thanks for your advice. Palm Oil can be tricky to find in stores. Red Palm Oil comes from the same part of the tree as regular Palm Oil, but is less processed and thus retains its red color. You could use this to make soap, but it will make your soap a reddish/orange color. 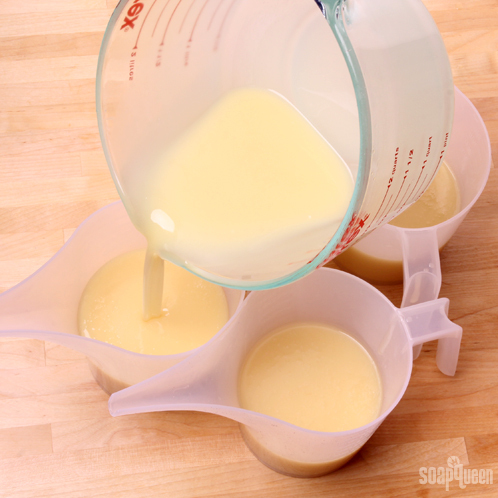 I have also heard of this oil staining molds, so I would be careful about that :). If you are looking for regular Palm Oil, it is available on Bramble Berry! For some reason when i do this or any soap for that matter, the soap forms a skin so fast and i cant blend it properly. Its also not thick like i always see in pictures or videos its really watery. (I do this with MP soap) Why is this? 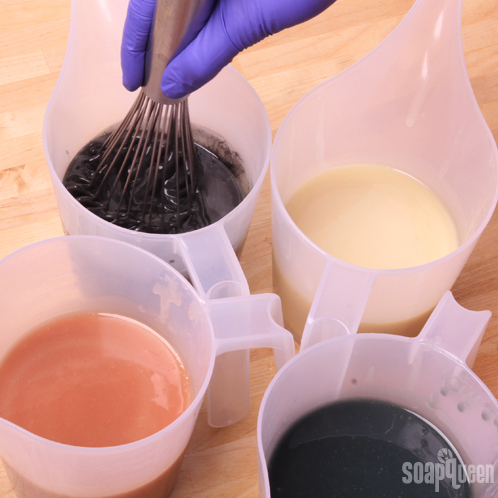 When you’re using natural colorants infused in oil to do a swirl, do you have to make two batches of soap and use the oil as part of the recipe, or can you split one recipe and then add colorant to one like you would with other colouring processes? 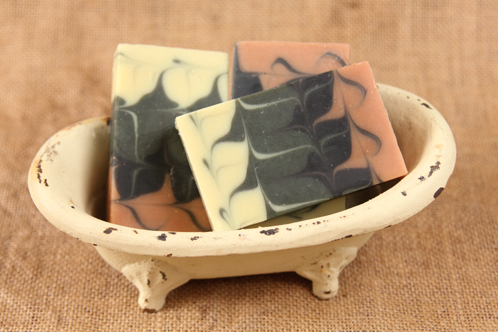 Beautiful soap and the smell is wonderful! I overprocessed before adding the colors. So it was rather goopy putting into the dividers. But it still made into a beautiful soap. I will post some pictures on my website as soon as I can. I’m glad that even though your trace was a bit thick, you were able to save it! 🙂 Can’t wait to see your photos! Would this need to be insulated? for 24 hours? We covered this soap, but did not place it on a heat pad :). 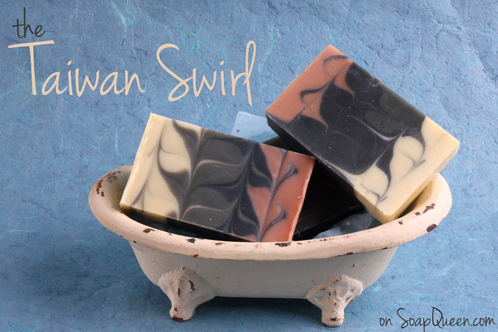 I hope you give this recipe a try, it’s such a fun soap and smells amazing! Instead of doing all that measuring, can we just use your Quick Mix or Swirl recipe? That cuts down on all my measuring mistakes. Thank you so much for the tutorials. I too have heard about the recent controversy with titanium dioxide and having been meaning to ask SoapQueen’s take on it. On a lighter note, I can’t wait to make this bar. I think I have almost everything, except that new divider. Scent sounds great too. Last time I tried this technique I had a bout of acceleration and I want to try this again. I hope you do give this soap a try, it’s a new favorite of mine! It smells so good 🙂 If you do give it a try, we would love to see a photo on our Facebook page! Regarding the question about Titanium Dioxide, the nano particles are the center of the controversy, and Bramble Berry does not use Titanium Dioxide that is nano-particle. There is no evidence that using normal particle sized Titanium Dioxide in soap (a rinse off product) leads to health concerns. Titanium Dioxide is on the list of banned ingredients that I got from Whole Foods. Also the State of California has it on a list for ingredients that larger companies have to report using. What is their reason (if you know) for not considering it a natural colorant? I don’t see that Whole Foods has titanium dioxide on this list (http://www.wholefoodsmarket.com/about-our-products/premium-body-care-standards) for their body care standards? So, I can’t speak to what their concern around body care may or may not be. In general, I do know that there is controversy over the use of ‘nano particles’ and often Titanium Dioxide is a nano-particle. Bramble Berry does not use titanium dioxide that is a nano-partice. The reason California is concerned about is for inhalation – so only aerosolized products. There is no evidence that it absorbs into skin in normal particle size nor is it a bio accumulator. Skin care (leave on) and soap (rinse off) would not apply to the issue around titanium dioxide and being aeorsolized. You will love the Multi-Pour Sectioning Tool, we are so excited about it! 🙂 Can’t wait to see what you make with it!